Pixar has had an unprecedented string of hit movies emerge from their studios. This book is their not-so-secret play book. So much on the ground, in the field, nuts and bolts experience is shared in these pages. President of Pixar Animation and Disney Animation, Ed Catmull, explains how Pixar took a note from Japanese production by instituting a principle that “No one needs to ask permission to take responsibility.” Thus, anyone at any level could halt production if they saw a problem. Catmull further explains how to fight off confirmation bias and truly get the best and most accurate information. The principle of “hurry up and fail” reveals itself as truly the best way to take action within creativity. Change, uncertainty, and instability will always accompany creativity. These things are not only inevitable, but are completely necessary to the process. Catmull explains how Pixar not only doesn’t eliminate them, but rather leans into them as a value to their creative process. 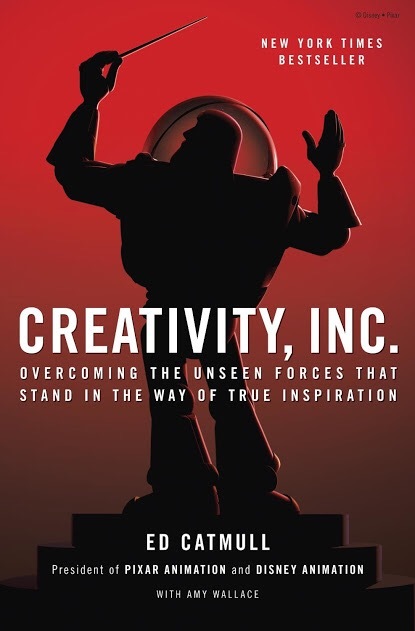 I believe this book became an instant classic on the subject of creativity and leadership. I’ll continue to refer back to it for years to come. This entry was posted on November 19, 2014 at 10:00 am and is filed under A Note to Directors, Creativity, Nuts & Bolts Stuff, Quotes, Rob Recommends, Thoughts on Leadership. You can follow any responses to this entry through the RSS 2.0 feed. You can leave a response, or trackback from your own site.